Summer's here and that means it's time to turn on the air conditioning system in your Honda to keep you cool for your daily commute or while on a family road trip. But a failing or damaged to the AC system can leave you hot under the collar from high service bills! By knowing the common problems with Honda air condition systems, you can save yourself a lot of money before you undertake any repair on your own. The air conditioning system in your Honda vehicle is comprised of several major components that work in concert to circulate refrigerant which cools the air entering the cabin. The heart of this system is the AC compressor which is a pump that compresses the refrigerant and pushes it through the piping that comprises the rest of your Honda's air conditioner. The AC compressor has more moving parts than any other part of the system and is therefore at the center of many of the problems that can cause your air conditioning to fail. Like most vehicles on the road today, the engine powers the compressor through an accessory drive belt that spins a pulley that rides on a bearing at the front of the compressor case. When the system is switched on, an electromagnet coil mounted behind the pulley will pull the clutch plate mounted on the end of the compressor shaft into the spinning pulley and engage the pump, circulating the refrigerant through the rest of the system. If it sounds complex, that's because it is and the AC compressor clutch is one of the most common points of failure on the compressor because of it. The proper operation of the AC compressor clutch is dependent on a smooth bearing inside the pulley, precise spacing between the clutch plate and pulley, and a good electrical connection to the coil. Damage or wear in any of those areas can prevent the AC system from fully engaging to cool you and your passengers. A worn bearing in the clutch will usually sound like a roar or grinding noise from under the hood that grows louder when the system is turned on. Not only is this annoying, but it can even generate enough heat to melt the accessory belt and cause other accessories like power steering to stop working! Improper AC clutch plate spacing or a weak AC clutch coil can also make a grinding or hissing noise as the plate slips against the pulley engagement surface. Partial engagement like this won't create enough pressure inside the system and so many Honda's will automatically shut the system down to prevent damage. A clutch coil with an electrical short can even cause damage in other parts of your Honda's electrical system and will usually blow a fuse. Another common point of failure on a Honda AC compressor are the seals that contain the oil that keeps the internal components of the compressor lubricated. And after tens of thousands of miles on the average Honda, it's common for these seals to leak. As the oil seeps past the seals, it can actually cause many of the compressor clutch problems we mentioned above. But once the oil is completely drained and your AC compressor is left without lubrication, the quickly moving parts inside will grind against one another and wear beyond their design specifications which will further damage the pump. In many of the cases we see in our garage this also leads to a slurry of compressor debris, ominously known as "Black Death", being pumped through the entire air conditioning system and causing even more damage! In either case of Honda AC Compressor problems, the most cost effective solution is to replace the entire ac compressor unit. Most compressors today can't be rebuilt or serviced without specialty and training beyond that of even the most expert automotive service technician. Finding someone to perform the job is not only time consuming, but incredibly expensive for the average DIY mechanic. Many of the new OEM Honda AC Compressors from BKHondaParts.com come with the clutch and coil pre-installed and adjusted. Just specify the year and model of your Honda and we'll ship it right to your door! 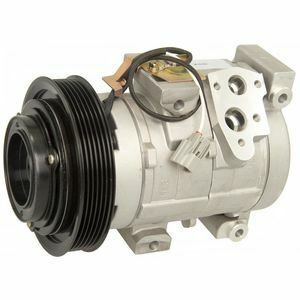 If you're unsure of which Honda AC Compressor you need, or which other parts your repair might call for, just drop a line to one of our knowledgeable parts associates by phone at 1-877-674-5525, or by email at orders@bkhondaparts.com and order with peace of mind that you're getting the right parts supplied by your Honda experts!